Imagine this. You are sitting at a restaurant. You order food and a bottle of wine that you’ve never tried before but sounded interesting on the menu. When the waiter pours a glass for you and you taste it you immediately love it. “We should find this and buy a few bottles,” you say. So you pull out your smartphone, open an app, and take a picture of the wine label. Despite the dim lighting, the app immediately recognizes the wine and shows you how much other users have liked it. Right there, next to the name of the wine is a red button with the price per bottle. You click it and within ten seconds, you have ordered half a case of the wine. Three days later it shows up at your doorstep. Ten years ago, this would have been an “in the future” scenario. But it’s exactly what Steve and I did a few weeks ago while eating at a restaurant called The Gorbals. The app is called Delectable and it works like magic. Even though Steve and I both work in tech, we still find ourselves awestruck at times at how amazing technology can be. We were also awestruck by some of the food we had that night, including a dish of crispy broccoli, doused in an umami-rich vinaigrette. 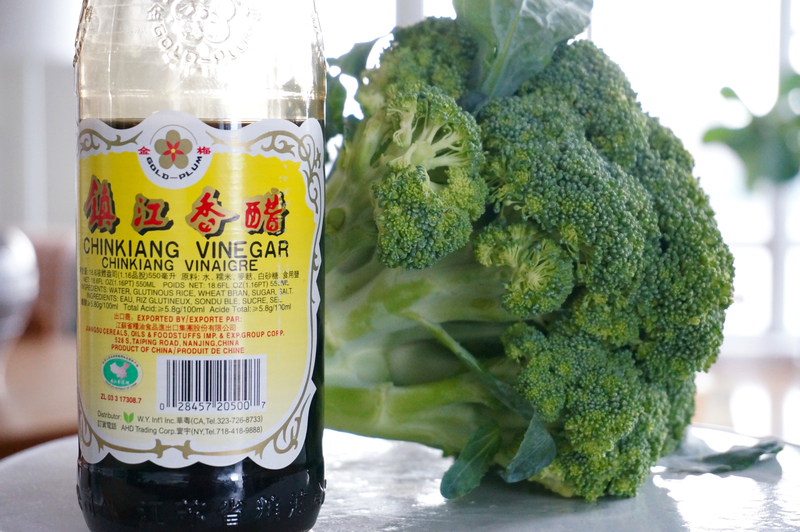 I immediately identified that it was made with black vinegar, also known as Chinkiang vinegar. It’s a Chinese vinegar made by adding acetic acid and bacteria to glutinous rice, but also to wheat, millet, or sorghum. It’s deep and soulful, with a light smokiness, a strong malt flavor, and a very distant hint of sugar. The very next day, I bought some broccoli and tried to recreate the recipe. I am pretty sure that they deep fried their broccoli but I was able to get pretty similar results by roasting it at a high temperature in the oven. 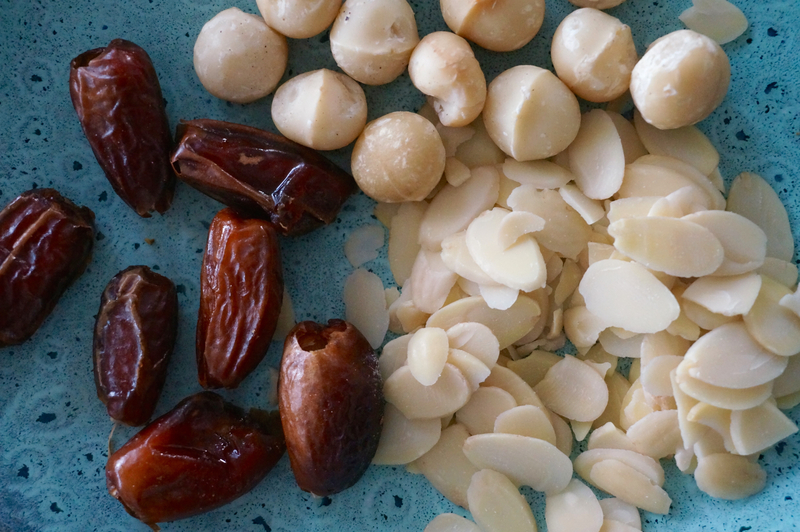 The result is an addictive combination of sweet, salty, and sour. Make a lot. You will eat it. 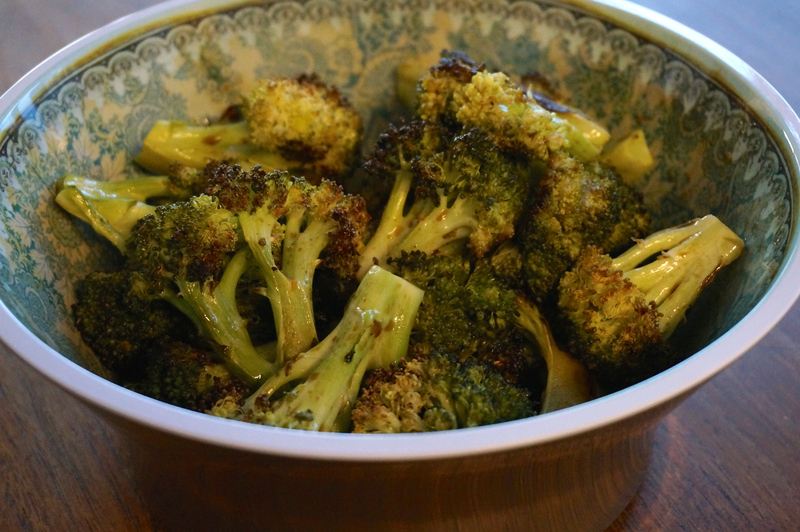 Preheat the oven to 425º F. Place the broccoli florets in a large bowl and add salt and pepper. Add the 2 tablespoons of oil and with your hands toss the florets well. Place in a large baking sheet and roast in the preheated oven for about 30 minutes or until the tips of the florets are very dark brown. Meanwhile, make the dressing by whisking together the vinegar, soy sauce, sugar, and 1 tablespoon oil. When broccoli is done, place it in a large serving bowl and pour the dressing over it. Gently toss it in the bowl to get it dressed. Serve immediately. Our trip to Cyprus was fantastic. In just a week, we did so much. We visited an ancient amphitheater, perched on a hill, overlooking the Mediterranean sea. We went to the little mountain church where I was baptized, built in the 15th century and still standing. In the village, where we stayed for part of the time, we got a private tour of the Byzantine icons museum from the most exuberant guide we’ve ever encountered, an elderly Cypriot man who told tales and mixed myths with science and at some point, serenaded us with a Byzantine hymn. We walked in the remains of a settlement from 9,000 B.C., their houses and retaining wall still partially intact. And of course we ate. There was the dinner my mom prepared, with homemade pastitsio, koupepia (stuffed grape leaves), and kleftiko (lamb cooked in the oven until it melts in your mouth). She made a Lebanese mahallebi, a dessert of custard, pistachios and syrup, that we kept searching for during the rest of our trip, with no luck. We ate shamali, a syrup-soaked semolina cake that I absolutely love, and kolokotes (turnovers with pumpkin, bulgur wheat, and raisins). We had Syrian food as well, with deeply flavored muhammara, lovely fattoush salads, and the most delicious chicken livers I’ve ever eaten. They tasted of olive oil, lemon juice, and cumin. One rainy afternoon, we ate pork souvlaki and sheftalies (ground meat with spices, wrapped in caul fat) cooked over coals and served in the large, oval-shaped pita bread of Cyprus. By the end of our trip, though, I started to really crave food from somewhere else. I wanted Chinese dumplings and mu shoo pork. I wanted pad thai or chicken laarb salad. I wanted kale with shitake mushrooms, smothered in a miso cream sauce. Something that didn’t include olive oil or lemon juice or ground lamb with parsley and onions or salad with tomatoes, cucumbers, and feta cheese . Of course, it’s been just five days since we came back, and I’m already wishing I could get my hands on some sheftalies for dinner tonight. 1. Place 2 tablespoons of the butter in a large, heavy-bottomed pan over medium heat. When melted, add the shallot, garlic, and a pinch of salt and pepper. Cook over low heat without letting the garlic and shallots color, about 3 to 4 minutes. Add the kale and continue to cook for a few more minutes until wilted. If it won’t all fit in the pan, just add what’s left after it’s cooked down a bit. 2. Meanwhile, in a small pan set over medium-high heat, melt 1 tablespoon of butter. Add the mushrooms and cook until softened and cooked through, about 5 minutes. If the mushrooms become too dry, add another tablespoon of butter. Stir in the soy sauce, cook another minute and turn off the heat. 3. 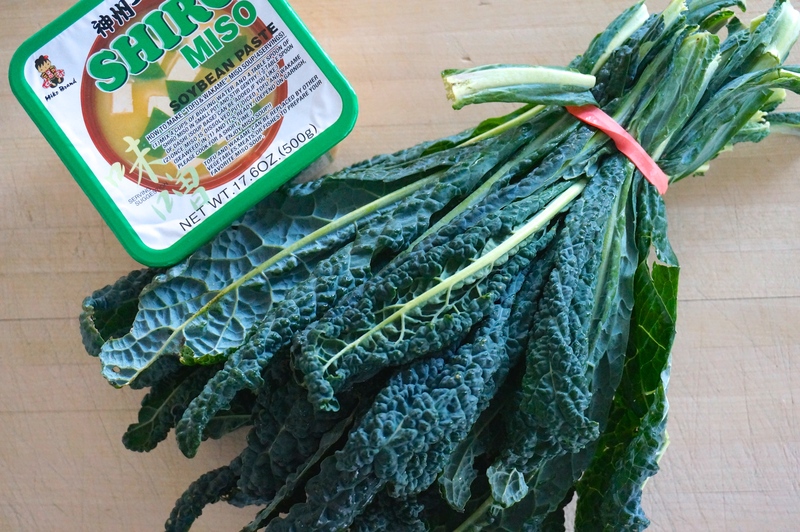 Once the kale is wilted and soft, increase the heat to medium high, add the vermouth and cook until it’s just evaporated, about 1 minute. Add the cream and miso, stirring until completely incorporated. Reduce heat to medium and cook about 2 more minutes until the sauce reduces slightly and tightens up the around the kale. Taste for seasoning (but don’t forget the mushrooms have soy sauce). 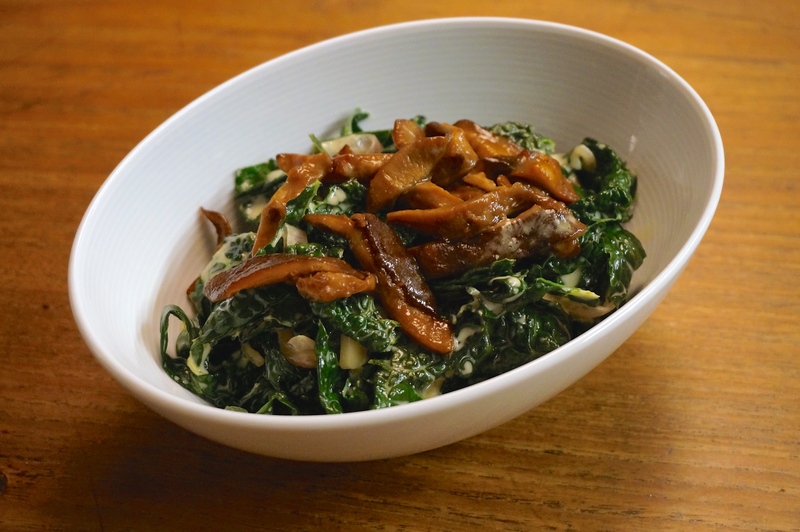 Place the kale on a warm platter and scatter the mushrooms over the top. Serve immediately. Note: If you don’t have time or the inclination to make your own tomato sauce, use your favorite brand. Avoid anything that has too many strong flavors, like olives or artichokes. Just a simple marinara sauce, with tomatoes and basil is perfect. 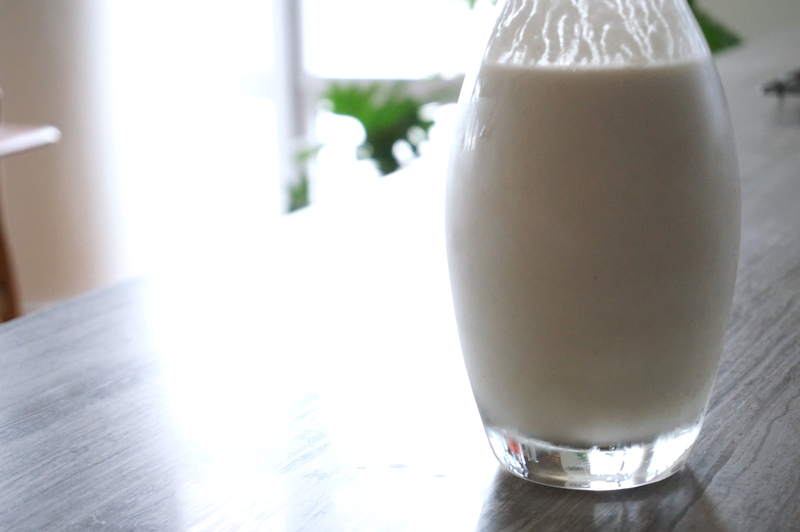 You will need the equivalent of 5 cups, so about 40 oz. First make the sauce. In a large pot, heat the olive oil over medium heat. Add the garlic and stir occasionally until garlic is golden brown. Add the rest of the sauce ingredients, bring to a brisk simmer and cook for 45 minutes, stirring occasionally. Discard onion, garlic and herb sprigs. Taste the sauce and season it with salt to your liking. Make ahead: Sauce can be prepared up to three days ahead and kept in the fridge, covered. Heat the oven to 400 degrees. Place flour, eggs and panko into three wide, shallow bowls. Season each generously with salt and pepper. Be really generous with the salt and pepper. Only a tiny bit will end up on the cauliflower. Dip a cauliflower piece first in flour, then eggs, then coat with panko. Repeat with remaining cauliflower. 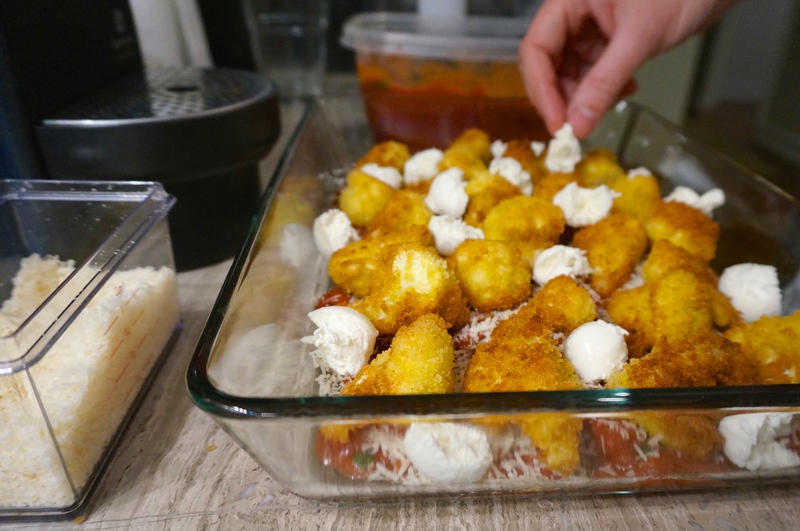 Place each piece of breaded cauliflower on a large baking sheet. Fill a large skillet with about 1/2-inch olive oil. Place over medium-high heat. When oil is hot, fry cauliflower in batches, turning halfway through, until golden brown. 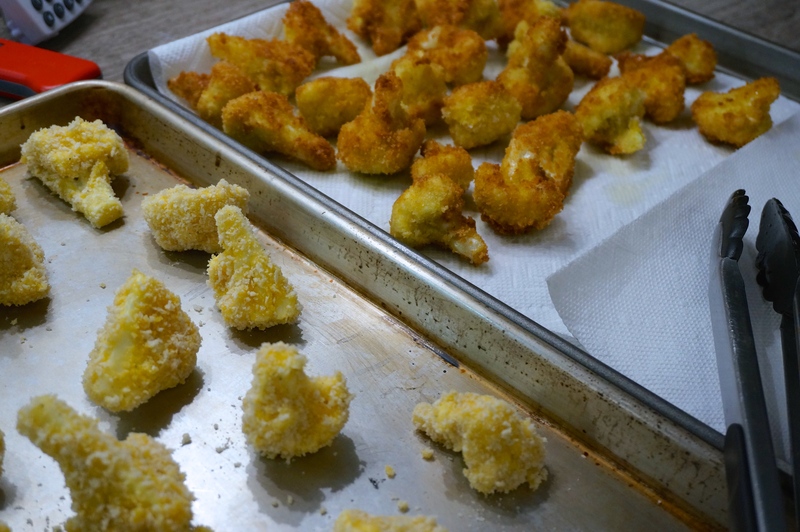 Transfer fried cauliflower pieces to a paper towel-lined baking sheet. Spoon a thin layer of sauce over the bottom of a 9-by-13-inch baking pan. Sprinkle one-third of the grated Parmesan over sauce. 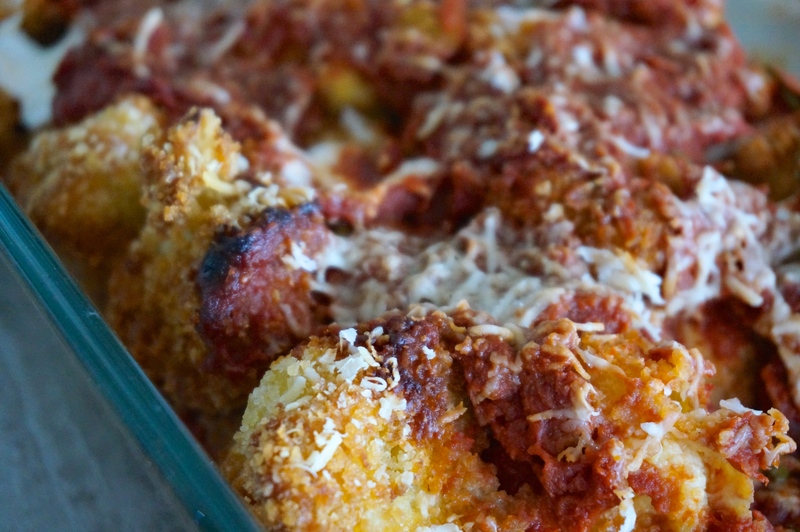 Scatter half of the cauliflower over the Parmesan and top with half the mozzarella pieces. Top with half the remaining sauce, sprinkle with another third of the Parmesan and repeat layering, ending with a final layer of sauce and Parmesan. Transfer pan to oven and bake uncovered until cheese is has melted and casserole is bubbling, about 40 minutes. Let cool a few minutes before serving.